You’ve been doing some filtering job with your contacts. You’ve added some tags, specified a timeframe of when a contact first appeared in your database, etc. Then something important occurred and you switched to, say, auto messages. When you return to the ‘All chats’ page, all filters are gone and you have to add them once again from scratch. And that is just a waste of time. So here’s the deal. We at HelpCrunch spent the last couple of months thinking how we could fix such minor problems which pass unnoticed by most of our users but can spoil overall experience nevertheless. That’s why we’ve added the autosave of all filters in ‘All Chats’, ‘My Chats’, or ‘Contacts’ database tables. So if you add a few filters and then switch to other service pages, your filters won’t go anywhere. They’ll be waiting for you. And that is just much easier than adding them all over again every time. Don’t forget to reset your filters once you don’t need them. Otherwise, you’ll always see only filtered contacts/chats in your list. So, as I said, for the last couple of months, the main task that our team wanted to resolve is to make your experience with HelpCrunch as pleasant as it goes. We’ve fixed some minor problems, added a bunch of bigger features and overall, tried to make our tool as easy to use as possible. And today, we deliver all this to you. If as a business you have to chat with clients speaking right-to-left languages (like Arabic, Hebrew or Farsi), we’ve got a big update for you. You can now set up your chat to be RTL or add this option on particular pages of your website. Read more here. Adding private notes to a chat thread. We’ve added the ‘private notes’ option to agent chat. While chatting with a client, you can now switch to the ‘Notes’ tab and leave a private message for your colleagues. You can freely discuss particular issues and leave important comments. They will appear right in a chat thread but will be visible only to other support agents of your organization. Editing chat messages. Do you love editing messages that you’ve already sent as much as I do? You can do just that from now on. You can now change ANY chat messages, but only if it hasn’t been forwarded to a client via email yet. If you have the ‘Resend Chat Messages via Email’ option turned on, you can’t edit messages that were already forwarded to your client’s email. Additionally, you can’t change auto and manual messages that appear in a chat thread (obviously). Saving response templates. You can now save any response right from a chat thread, no need to copy paste it into the ‘Saved Responses’ page. It can be really convenient when you have to write the same answers over and over again. Now, you can save your response once and then just paste it into a chat whenever you need it. BTW, as much as it’s important to track your overall chat rating, it’s also crucial to know who exactly wasn’t satisfied with your chat service. That’s why all the metrics in any chat report are now clickable so that you could see who exactly rated your chat and how. It’s a great option for those who want to follow up on their frustrated customers, for instance. 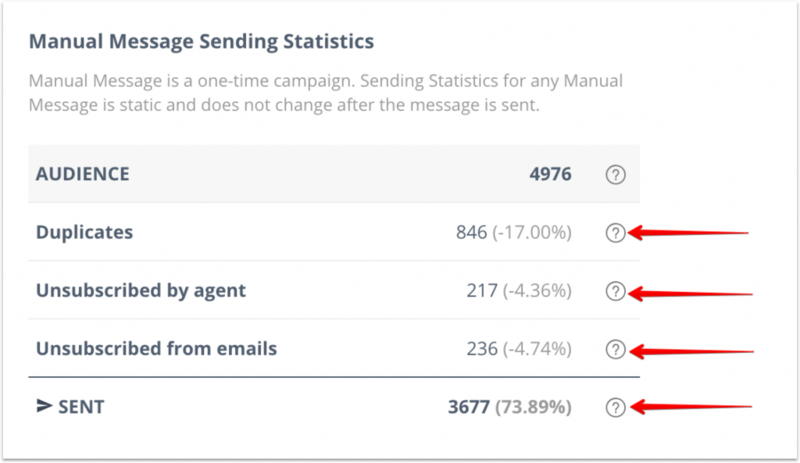 So, once again, chat metrics are now clickable, and so are the metrics in the Auto and Manual Messages’ analytics. You can now easily check who opened, clicked and replied to your message. And not only check, but also export a list of these contacts as CSV or XLSX files. ‘Is not’ option to proactive chat rules. More specifically, ‘is not’ filter allows you to exclude browser languages, website pages, cities and countries from your proactive chat triggers. New proactive chat rules. We’ve also recently added some proactive chat rules like ‘Country’,‘City’, and UTM (source/medium/campaign) tags. An ability to specify an alternative for personalization attributes. When adding custom data attributes to your message, you can also specify an alternative for it. It will be used for contacts which don’t contain the necessary data. There are certain pages on your website where having a live chat window is crucial, as well as there are pages where you’d want to hide it. Hiding a chat widget on certain web pages is now as easy as pie. Just go to Settings -> Website widgets -> [Your widget] -> ‘Widget Customization’ tab. You can add a bunch of rules specifying where you want to show or hide your chat window. Also, pay attention that the REST API settings take priority and cancel settings made in the HelpCrunch interface. If you delete all the rules, the chat widget will disappear from all pages of your website. To avoid this, make sure to leave one rule with an asterisk (*) in it. We automatically add it as the first rule to make your life easier. Chat localization based on a customer’s location. We’ve added the option to choose which localization will automatically appear in a chat depending on a client’s browser location. Previously, you could do this only with the help of REST API, but now it’s all in your settings. Also, note that the REST API settings take priority and cancel settings made in the HelpCrunch interface. Allow/disallow attaching files in a client chat. If for security reasons, you don’t want your clients to attach any files while chatting with support agents, you can do so now. Just go to your chat widget settings and uncheck the corresponding field. You can do this in the ‘Widget Customization’ settings. Agents’ online statuses. If you have ‘admin’ or ‘supervisor’ rights in a HelpCrunch account, you’ll enjoy this feature. You can now see which of your support agents are online and available at the moment right from the ‘Agents’ section. Adding an email signature in HTML format. You can now set up your email signature right from the ‘My Account’ section. In addition, Supervisors and Admins can do this from the ‘Agents’ page as well. When specified, it will be added automatically to all your manual messages. On top of this, we’ve also updated our iOS/Android apps and SDKs and added some great improvements to them. But really, all you need to know about them is that you can now add emojis to your push notifications. And full names. No kidding. Just try it. By popular request, we’ve added tags to the User Structure. This will allow tagging chats via the REST API. For more information, see our documentation. I hope you will enjoy our new features as much as I enjoy using emojis whenever I can (and you better believe me, I love emojis!). Do you have any ideas of what else we could add to the HelpCrunch service? We’d love to hear them, so feel free to leave them in the comments section or just hit the chat button. We've been working on HelpCrunch improvements and updates for 100 days and now we're ready to tell you about tons of good stuff. Just check our winter updates out. 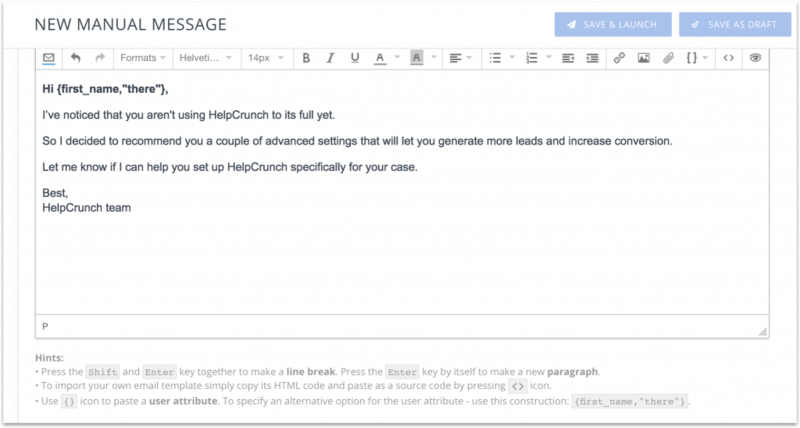 HelpCrunch is launching its very own free subscription plan today. You can test our live chat tool for however long you wish to and upgrade it to our paid subscription plan at any point.